Picture this situation: You’ve chosen the right social media platforms for your business and are posting good content to each one of them, but you’re not getting any more than just a handful of clicks. But let me ask you a question: How many, of all the links that appear in your newsfeed throughout the day, do you actually click? The fact remains that you see oodles of links you don’t bother clicking. Hopefully, you’re feeling a bit relieved after this stark disclosure. However, if traffic’s been dying down (especially after the recent organic reach debacle), you may need to revamp your social media marketing strategy (if you have one already) or create a new one with the assistance of an expert or an agency. Today, the organic reach of Facebook page posts has reduced by a drastic 80%–90%. For example, a Facebook page like Picsity (with close to 1.3 million Likes) that regularly enjoyed a reach of 10,000 per typical post a few months back now suffers from an incredibly low reach of 500 per typical post. But should you stop using social media sites because they aren’t driving your websites and blogs enough organic traffic anymore? Well, you shouldn’t (and, actually, you can’t) because there are ample reasons to be on social media other than traffic. Consistently, social media experts have reiterated that the focus should be more on “social” and less on “media.” You shouldn’t measure the worth of a social media account by the total number of its fans or followers. Social media, at its very core, is about building meaningful relationships, which depend on the quality of the conversations you have with your community. Lack of strong bonding renders even thousands of fans and followers useless. In the traditional business world, organizations or companies are connected with their clients through transaction-based associations, as opposed to relationship-based associations. Relationship building gives social media platforms their uniqueness, and it’s something that traditional advertising can never achieve. Social media has been helping companies or business owners find partners, customers, and investors. If you approach social media as a relationship building tool, it’s still as powerful as it’s always been. For a business, social media is not just about tweeting or posting updates to Facebook. Recently, LinkedIn conducted a survey to understand how SMBs look at social media in regard to their businesses. 81% of the SMBs the company surveyed use social media. Of this group, 94% use social media as a marketing tool. However, 49% of the surveyed SMBs admitted that they also use social media as a tool to keep themselves abreast of the latest industry news and best practices. By following other businesses, industry experts, and thought leaders, they learn more about individual niches and markets while also getting answers to many of their important business questions. Social media sites are excellent when it comes to finding intriguing content ideas. By creating meaningful conversations of your own or simply participating in the existing ones, you’ll be able to gather a lot of ideas to create a variety of useful marketing content. Copyblogger, for example, creates a discussion on LinkedIn after they’ve published a new post on their blog. This opens up opportune avenues for them to discuss a particular topic on a deeper level, engage with the audience, ask for their feedback, and collect out-of-the-box ideas for future blog posts and content in other formats. The Twitter Search feature is another good tool for finding content ideas. It allows you to quickly track the trending hashtags and eavesdrop on existing public conversations for new topics and ideas. Social media websites, groups, and communities, therefore, offer you abundant material to help with the content generation process on an ongoing basis. All you need to do is turn on your social listening ears when you’re using social media sites. If you don’t want to waste time digging through a pile of resumes or wading through a sea of bad candidates when planning to hire talented professionals from a specific industry, social media is your answer. According to a report published by Staff.com, as much as 92% of companies leverage platforms like LinkedIn, Facebook, and Twitter to locate, screen, and hire quality candidates for numerous job positions. In an interview of 40–60 minutes, it can be quite an effort to evaluate an applicant in terms of their skills and personality. With the help of social media, however, you can quickly screen a candidate and identify the traits that could affect their performance at work. It’s crucial to note that 73% of recruiters say they have made successful hires though social media. Conversely, 1/3rd of employees also rejected applicants on the basis of what they found in their social media profiles. There are several ways to find potential job prospects via social media, from your own social referral network to special features like Advanced LinkedIn Search. Once you’ve spotted potential candidates, you can start analyzing their social media profiles in terms of current employers, skills, work experiences, joined groups, interests, connections, quality of updates, and more. Being on social media, if you aren’t aware, increases productivity at work. According to a recent study by Ipsos and Microsoft, 46% of people agreed that using social media enhanced their productivity. But the result depends on what exactly you use social media websites for. If you’re checking out industry-related tweets and Facebook updates by competitors, it will certainly give your productivity level a quick boost. On the other hand, using the social platforms only for personal reasons won’t help much. Don’t let social traffic become an obsession. 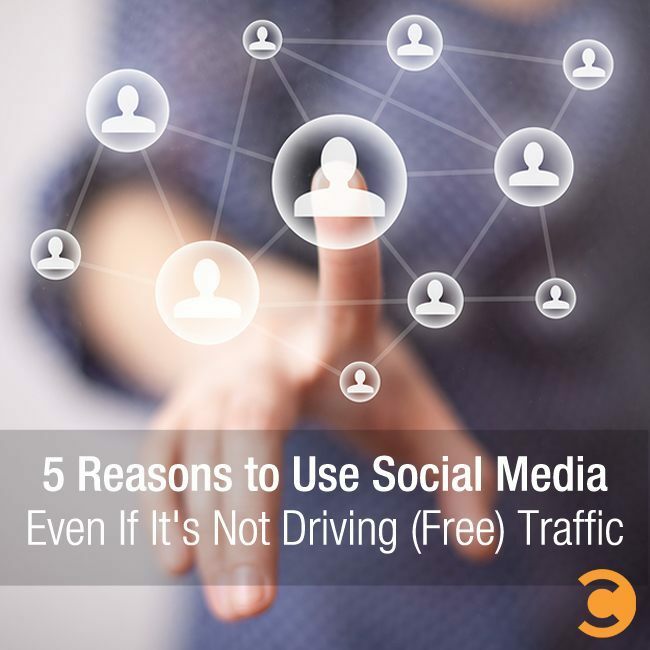 Driving traffic to your websites and blogs should be one of the reasons to use social media, but not the only one. Change the way you look at social media, and you’ll soon see that it has a lot more to offer than you could ever expect. Obaidul Haque is a freelance writer and blogger with a well-rounded knowledge of SEO, social media, and content marketing. Previously a content manager at IndiaMART (India’s largest online B2B marketplace), he now works with a wide range of clients globally from his home in Kolkata, India. Music is like oxygen to him.